I recently spoke with Rebecca Rescate for the Shark Tank Blog. 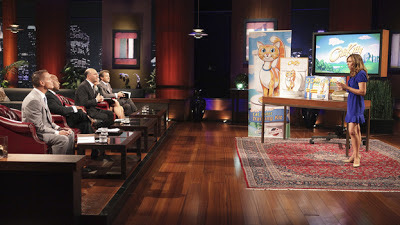 She's the woman who scored a deal in season two for CitiKitty, the product that teaches cats to poop on the toilet. Rebecca made millions with that product and she returns in season 4, episode 415 to pitch a second product called the Hoodie Pillow. She's the first Shark Tank entrepreneur to return to the show with a new product. I spoke with Rebecca about CitiKitty, The Hoodie Pillow, and her new consulting business. I also asked her THE QUESTION: "Do you put ketchup on your hot dogs?" Her answer: "Of course! I put the works on everything I do!" Well Rebecca, going for the works in business is certainly admirable, but when it comes to hot dogs, you may benefit from addition by subtraction!